Buy Local Produce Near Bethany from Puddle Duck Farm! Meet Puddle Duck Farm owners Merridy Senior and Eben Hancock. Puddle Duck is a 100-year-old farm, purchased by the pair in 2012. Since then they have filled their days with working on house and barn improvements, caring for animals including cows, chickens, ducks, goats, and two cats. And in 2013 baby Sawyer joined the family. The couple is not new to farming though. They actually began in 2009 when they became involved with running a local sugar bush just outside of Millbrook. The following spring, they added honeybee hives and discovered beekeeping. Finding Puddle Jump Farm to purchase was the next logical step. Cut flowers – they planted 10,000 Gladiola bulbs the first year! Since then they have added sunflowers, zinnias, strawflowers, and asters. You can find their bouquets at the farm, community events, local markets, flower shops and the grocery store. Honey – their bees gather pollen and nectar from the wildflowers on the property. The Honey is unpasteurized and available in both liquid and cream form. Maple products – they have approximately 2000 taps to produce maple syrup at a sugar bush just outside of Millbrook. It takes 40 gallons of sap to produce one gallon of syrup! In addition to maple syrup they produce maple butter, maple sugar candies, and granulated maple sugar. If that was not enough, they also produce organic freezer meat and free range eggs. All of the produce is grown without the use of herbicides, pesticides, fungicides or chemical fertilizers. Puddle Duck Farm also participates in a community farm, but that will be featured in another post! Visit the farm at 541 Glamorgan Rd., Millbrook, Ontario. Tapping for Maple Syrup near Bethany, Ontario! A small start to a large and wonderful tradition! Maple syrup is often referred to as the first agricultural crop of the year. The process can begin when there is still a large amount of snow on the ground, as long as the temperature is right. The flow of maple sap is a much better indicator of spring than the ground hog! 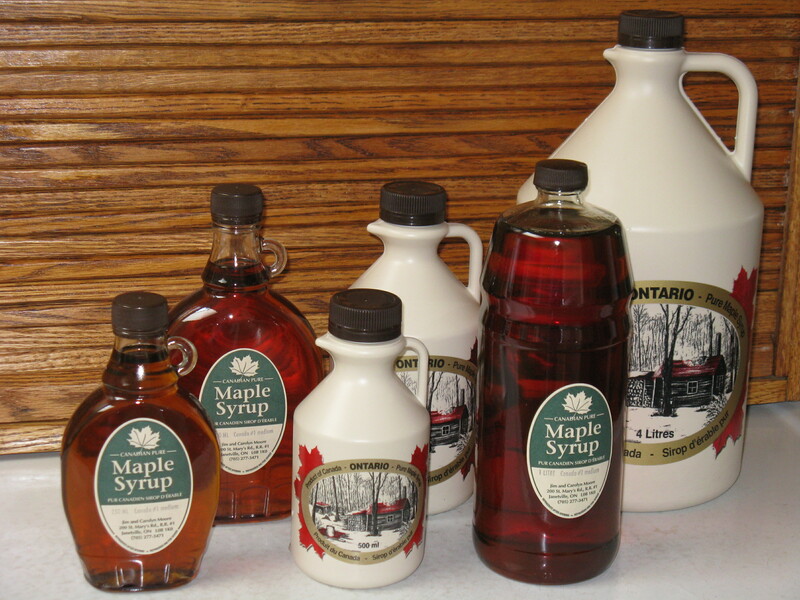 Moore’s Maple Syrup is available in many different sizes. I recently spoke with Jim and Carolyn Moore, who began producing maple syrup in 1985. All good stories have a beginning – and it began with 25 taps on the maple trees along their driveway. They boiled the sap down in an enormous cast iron pot outdoors over an open fire. The result? 19 litres of smoky, dark and delicious syrup! 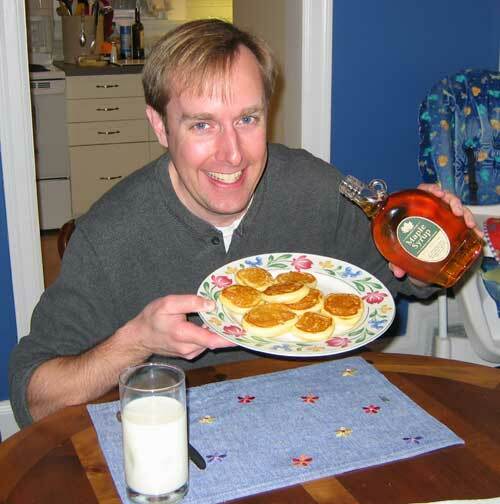 I couldn’t resist adding a picture of myself enjoying Sunday morning pancakes with Moore’s Maple Syrup! The next year they tapped 100 trees, using a variety of pails to collect the sap, followed by boiling in an old flat bottomed pan on a homemade furnace. Three short years after their first efforts they went all out and tapped the whole 17 acre maple bush! 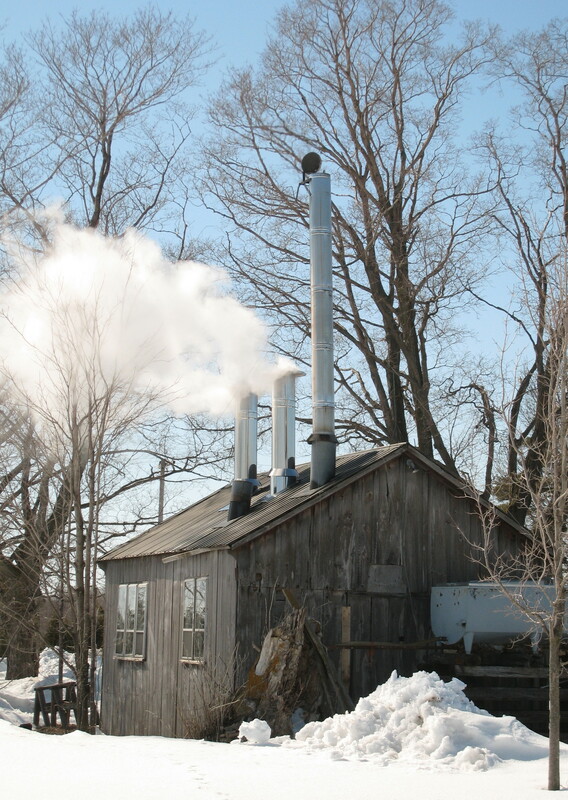 They installed pipeline, and renovated a farm shed to be a sugar shack for their new stainless steel evaporator. The Moore’s Maple Syrup Shack in action! Now, for more than 27 years they have produced around 900 litres per year from 1,000 taps. Depending on the weather, they generally tap in early March, and boil whenever the sap runs — anytime up to mid-April, whenever nights are freezing and days are above 0. I asked how much sap was needed to produce 1 litre of syrup and I was amazed at the answer – 40 litres of sap produces 1 litre of syrup! That is a lot of sap, a lot of boiling, and a LOT of firewood! 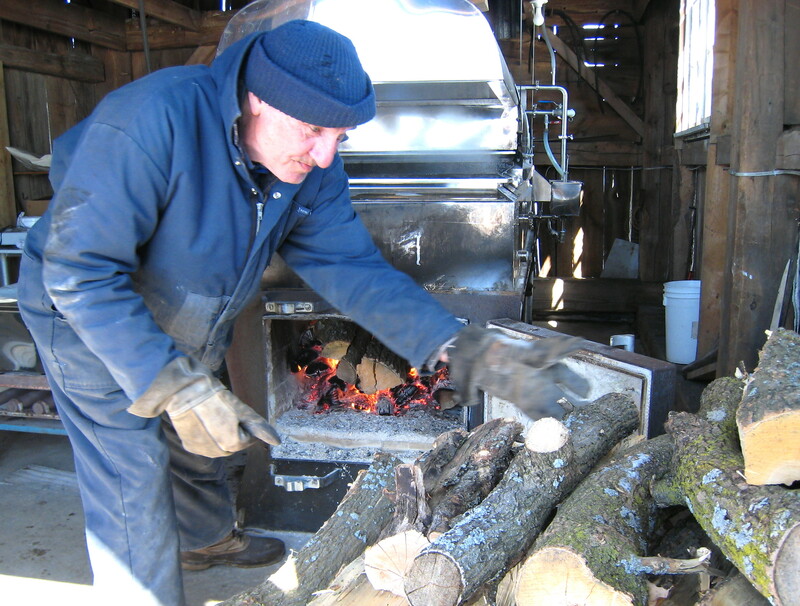 Jim Moore tending to the Sugar Shack fire! Right now Jim and Carolyn are tapping the trees, helped out by their two sons from Toronto. They will be working on snowshoes because the snow is unusually deep. After the tapping it will be time to focus their energy on washing the collection tanks, re-washing and re-assembling the evaporator, and generally getting everything ship-shape for the first boil. The race is on to be ready for the first good sap run! 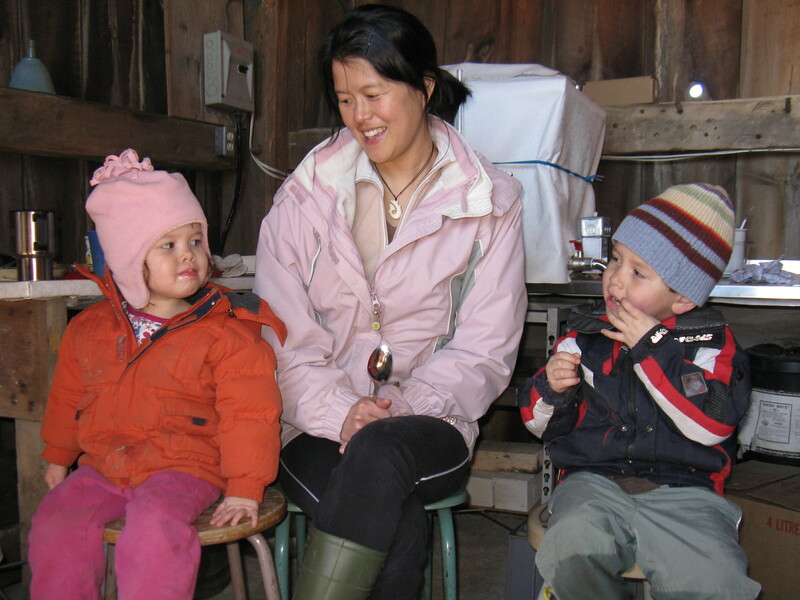 Fun for the whole family at Moore’s Maple Syrup Farm! The sap comes out of the tree with a sugar content of approximately 2.5%. It is then boiled until it reaches a sugar content of between 66% and 67.5% – a huge difference! Don’t miss your chance to get some of this year’s fresh, local natural maple syrup. Tell them Jeff sent you!